Both the general public and policy makers see home ownership as a major life goal. Owning a home is a form of capital that creates a social safety net (Elsinga, 2005; Moser, 2009). Home ownership can also help boost self-esteem and contribute to housing satisfaction (Elsinga & Hoekstra, 2005; Marcuse, 1972). In South America, owning your own home is a way to ensure basic economic security and is a dream shared by everyone. For this reason, large-scale investments are needed in owner-occupied homes for low-income buyers. A different light is shed on this dream however when it becomes clear that the quality of subsidized property for low-income groups is subpar due to poor maintenance and buildings quickly deteriorate. This occurs in Chile, Mexico, Brazil, Colombia and Ecuador (Paquette-Vasalli & Sanchez, 2009; Rodriguez & Sugranyes, 2005; Rojas, 2010). Most studies into housing quality and poor maintenance have been conducted among single-family homes owned by individuals. In South America, especially in cities, low-income homes are usually apartments. This means ownership is shared with other building residents. Most maintenance-related issues occur in joint ownership properties and there is little literature available on this topic. The aim of this study is to gain more insight into how homeowner’s associations work in low-income owner-occupied apartments. When parts of the residential buildings such as the ground on which they are built and the infrastructure are joint property, then a homeowner´s association is necessary to keep maintenance of the common property parts. The lack of maintenance of these communal areas is a problem of increasing proportions, which has prompted this research. 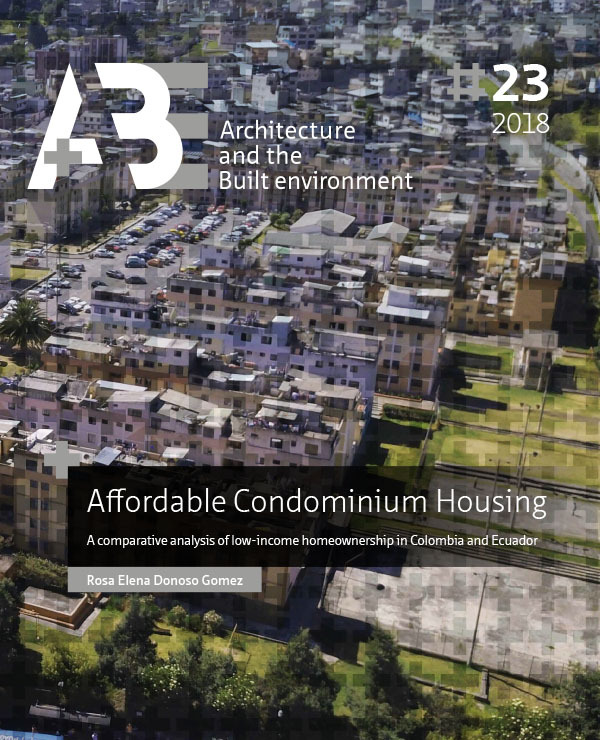 Which factors play a decisive role in how homeowner’s associations function and how building maintenance is organized, how important is the horizontal property law and how does this affect low-income housing policy in Colombia and Ecuador? This PhD dissertation consists of three components: Part 1 presents the research question, the theoretical framework and the research methods. Part 2 discusses the formal institutions (the rules of the game) involved: housing policy and the property law. Part 3 discusses the informal rules which include the cooperation between professionals and the interaction with residents (the play of the game). The summary includes conclusions and implications for follow-up research and policy. Comparative housing research can serve multiple purposes; for example to evaluate policy and perhaps implement policy that has been successful in other countries. This dissertation is based on a comparative study of two countries and uses the “middle range approach” as discussed in Haffner et al. (2010). With this approach, the assumption is that institutional differences between countries are of crucial importance, but that a comparison is worthwhile and may prove beneficial. This dissertation has a comparative structure that takes institutional differences that are important to home ownership of low-income families into account (Elsinga, 1998; Oxley, 2001; Ruonavaara, 1993; Stephens, 2011). The central hypothesis is that the design of the horizontal property law is of great importance to the effectiveness of homeowner’s associations and maintenance levels of buildings and homes. A comparison of Colombia and Ecuador, neighboring countries with similar housing systems and cultures but different horizontal property law, is a good way to test this hypothesis. The horizontal property law or law for condominium form of ownership is a formal institution. Formal institutions, together with the informal institutions such as values, determine the rules of the game for actors. (North, 1994:360). This institutional approach is beneficial to studying the functioning of homeowner’s associations. In the further elaboration of the research framework, Ostrom´s (1990, 2005) institutional analysis and development framework (IAD) was used as a starting point. The Institutional Analysis & Development (IAD) framework makes it possible to analyze the actions in a complex situation and to map the multiple positions of actors. The IAD framework distinguishes three groups of important factors: characteristics of the community, the rules used and the physical characteristics of the common property (Ostrom, 1990, 2005). An important assumption is that actors are not necessarily selfish and rational. Another assumption is that people are not by definition helpless and unable to work together. The Ostrom approach provides researchers with a framework for mapping out the potential contributions of a community. This framework provides good leads for the analysis of the central problem in this dissertation: poor maintenance in collective homeownership. A network analysis was then applied to study cooperation among the professionals involved in the provision of low-income housing in condominium. This analysis involved professionals from the municipality, developers, property managers, banks and social workers in Quito and then Bogota. These analyses were conducted using focus groups. The main focus during the discussion was the recognition of the problem of poor maintenance, an analysis of the possible causes and an exploration of possible solutions. The network approach appears to be useful because it shows that there is complexity and a large degree of interdependence among actors. The analysis of the role of the residents was identified with a survey among 414 residents of 8 different housing complexes with low-income condominium housing. It involved 4 blocks from different construction years in Quito and 4 blocks from different construction years in Bogota. The questionnaire distributed among residents was inspired by Ostrom’s IAD framework. The “mixed method” approach was necessary to map the interaction between formal and informal institutions. This approach is the result of the choice for a “middle range” approach that distills the similarities and differences between two cities/countries with different institutions. The aim is to learn lessons that can lead to improvements in the maintenance in homeowner’s associations for low-income households. In both Bogota and Quito, the majority of households live in owner-occupied dwellings, mostly apartments in condominium. The government housing policy in both countries mainly consists of subsidizing owner-occupied homes for low-income households. The description of the housing policy shows that building homes is a complex affair that requires a great deal of cooperation between parties including local governments, developers, the land registry, funding bodies and the national government as the subsidy provider. Finally it appears that the registration of the policy outcome gives incomplete information for policy evaluation. In practice, homes that are built are registered as single units when they are actually part of housing complex in condominium. The horizontal property law plays a key role in how homeowner’s associations function. The law defines which actors are responsible for the management and maintenance of the shared property. Research has revealed that there are key differences between the laws in the two countries. In Colombia the law stipulates that the first assembly meeting of the homeowner’s association must be called by the builder. In Ostrom’s words: Colombia has embedded a collective choice-rule in a constitutional one. This concerns a clear and unambiguous anchoring of the body most important to how a homeowner’s association functions. In Ecuador, the law does not provide a definitive answer on when a homeowner’s association should be established. In practice, it turns out that it’s usually up to the project developer to make this decision. Another important difference between the two laws is the responsibility for the management of the homeowner’s association. In Colombia, the law stipulates that this must be organized by a professional and paid manager of the homeowner’s association, whereas the law in Ecuador is more flexible and it allows for the position to be filled by a volunteer or paid position if the association can afford it. In both Bogota and in Quito, professionals have indicated that in the realization of owner-occupied apartments for low-income families, they depend on the local government and funding bodies. In both cities a link was found between maintenance issues related to homeowner’s associations and the contents of the horizontal property law specifically lack of clarity about the rights and obligations of the joint owners. The law is not clear to everyone and not everyone is aware of the law. The analysis shows that all participants acknowledge the problem, can identify various causes and agree that it is unclear who the responsible party or problem owner is. For Bogota, research showed that overdue maintenance problems are usually due to poor management decisions by the professional responsible for the homeowner’s association. Research in Quito yields other explanations: a lack of community spirit, lack of respect for rules and standards and different ideas about the use of common spaces. From this it can be concluded that there is a connection between how homeowner’s associations in Bogota and Quito function and the property laws in Colombia and Ecuador. In the words of Ostrom: “the activities and policies of external political regimes can affect the level and type of self-organization to achieve collective benefits” (Ostrom, 1990: 190). The professionals recognize and emphasize that their role and interpretation affects how homeowner’s associations function in the long term. The perception and opinion of the residents about maintenance problems was mapped out on the basis of a survey that was carried out in 2014. The survey included questions about the composition and characteristics of the households, their awareness of their position in the homeowner’s association, their behavior and their relationship with the condominium regulations. The results are in line with Ostrom’s framework. It appears that: (1) trust in leaders of the community, (2) agreement about who is responsible for maintenance, (3) participation in assembly meetings, and (4) adequate physical conditions of the building, are conditions for adequate maintenance outcomes. Owners collectively need information, as well as knowledge about rules, to be able to manage the condominium. The results show that legal obligations can have a counterproductive effect on the involvement and self-organization of homeowners. The property law in Colombia stipulates that a professional administrator must be appointed to manage the homeowner’s association. The result is that residents feel less personal responsibility and attend fewer meetings of the homeowner’s association. In Ecuador, the rules for maintenance are much more flexible and the chairman of the homeowner’s association can assume the role of manager. As a result, the residents appear to be more involved in the homeowner’s association’s decision-making processes, but are generally less satisfied with the outcome. The horizontal property law plays a key role in achieving better maintenance results in Bogota. The project developer is responsible for ensuring the legal requirement to appoint a professional homeowner’s association administrator. The law stipulates that a maintenance plan must be drawn up before building materials in the residences start showing signs of deterioration. A maintenance plan and a detailed payment plan for contributions to the homeowner’s association must be ready by the time the homes are completed and residents move in. This is in line with Ostrom’s IAD framework, when she says that when rules of the game are known, specifically the benefits and costs, the outcomes are more satisfactory (Ostrom, 1990). Most studies into maintenance by homeowner’s associations research the relationship between maintenance and the characteristics of households and homes (Orban, 2006; Alterman, 2010; Hastings et al., 2006). This study also included these variables in addition to the formal rules and the ability to self-organize in homeowner’s associations. By using the IAD framework, it became possible to investigate the interaction between formal and informal institutions (play of the game). A comparison of the “play of the game” in Bogota and Quito allowed for conclusions to be drawn about the influence of the differences in both countries’ property laws. Uncovering the relationship between the horizontal property law and its effect on the functioning of a homeowner’s association through a combination of quantitative and qualitative research is an added value of this research. The significance of these outcomes goes beyond Bogota and Quito and contributes to insight into mechanisms in the functioning of home owner’s associations in general (Bengtsson & Hertting, 2014). This research provides input for the research questions of the future. A first follow-up line of inquiry is the impact of the functioning of homeowner’s associations and the maintenance results on the increasing value of homes. Further studies are required into the functioning of the owner-occupied apartment market and specifically the role of collectivity in housing preferences, how maintenance fees are set and how the organization of a homeowner’s association influences the value of apartments. Dilapidated homes have a major impact on the quality of life in neighborhoods. Urbanization, densification and promoting homeownership go hand in hand. The share of owner-occupied apartments is raising rapidly and with it the risk of poorly functioning homeowner’s associations. The management of collective homeownership is part of the research agenda of sustainable, resilient and smart cities. This dissertation presents a framework for international comparative research into the functioning of homeowner’s associations. Insight into the interaction between formal and informal institutions is crucial in a world in which citizens have to take personal responsibility, governments have ambitious goals and quality of housing and life is at risk. This dissertation shows that the number of homeowners’ associations is greater than official records indicate. There is room for improvement when it comes to the registration of property because this is essential to good housing policy implementation and evaluation. As cities grow, densification and the continued construction of apartment buildings require policy for owner-occupied apartments that is featured prominently in housing policy. Poor maintenance of common property parts is a collective issue that has major implications for the quality of life in urban areas and the asset of individual homeowners. National policy for the construction of subsidized owner-occupied homes must be accompanied by local policies for the proper management of homeowner’s associations. The quality and sustainability of low-income housing should be part of housing policy monitoring and evaluation. Shared spaces and common land with facilities deserve special attention. The joint ownership of land and facilities can also be a source of income and joy. Climate change has implications for the quality and sustainability requirements of homes, which will inevitably lead to large-scale renovations. Renovation requires collective decision-making for façades and other parts of the building that are viewed as the collective property of the homeowner’s association. The availability of funding options is also extremely important for these types of renovations and this is a responsibility for the government and for profit and non-profit financial institutions to facilitate access to financing that can be paid off by the homeowner´s association. Natural disasters such as earthquakes occur frequently in Bogota and Quito. Joint ownership requires joint insurance for earthquake damage. The 2016 Quito earthquake may serve as a wake-up call in this respect. If there are collective action dilemmas and apartment buildings do not comply with the law regarding the obligatory requirement to have insurance for all kinds of damages, the government can play a role in overcoming these dilemmas by offering guarantees. Policy for condominium ownership in growing cities is essential to creating resilient cities. The old adage ‘my home is my castle’ is in dire need of adaptation in the case of condominiums, as “our castle” would be more appropriate here.